So the promo starts off where many people though the premiere would – with young Brandon Stark, north of the wall and unseen since the fourth season finale. Bran, who many in the realm still believe was killed at the hands of Theon Greyjoy way back in season two, is now (along with Summer, Meera Reed, and Hodor) in the presence of the three-eyed raven (Max Von Sydow – The Exorcist, Strange Brew). From there we see Cersei backed up by our Zombie-fied Mountain. Those guards might want to get out of her way. After Cersei’s shaming and Myrcella’s death, you almost have to root for her this season — almost. The season premiere gave us something somewhat rare – some Stark luck saw Sansa and Theon rescued by Pod and Brienne of Tarth. This trailer gives Sansa another shred of hope as she learns her sister Arya, who much like Bran has been long believed dead by the realm, is, in fact alive. She doesn’t know that Arya had been killing her way across Westeros for three seasons before making her way east to become a blind bo-staff champion. Sansa’s assumed route, the one that Theon suggested was to head North and go to Jon for help – much like Arya originally intended. We don’t know if this will be Brienne’s plan as well, but Ramsey certainly assumes so, and he plans to attack Castle Black to retrieve his bride. Then we see the High Sparrow with Jamie Lannister, a meeting that many people have been waiting for. Jamie, with his sister/lover shamed, his brother on the run, father dead, and two-thirds of his children murdered, seems to have little left to lose. This should be an interesting exchange. 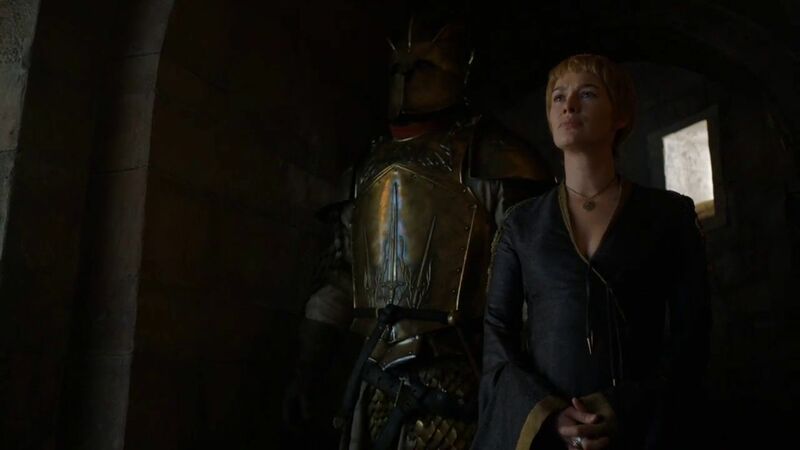 It’s funny how allegiances change – imagine rooting for the Lannisters back in season one, after Lady was put down and Jory was stabbed in the eyeball. Finally, we get some quick flashes of Castle Black as it seems Davos and Ghost will have to make a stand, and of Tyrion getting up close and personal with the remaining dragons. Looks like a promising episode. Previous PostHerald: Lovecraft And Tesla Teaming Up For The Small ScreenNext PostVHS Vault: Adventures In VHS – New Book Brings VHS Memories To Life.